There's more to Independence Day than fireworks. Try one of these fun themed project ideas to help your children feel more connected to this fun holiday. Since Independence Day has its roots in American History, most Fourth of July kids activities are centered around Americana. What is Americana? It is stars and stripes, bald eagles, fireworks, apple pie and other cultural icons unique to patriotic American culture. Each of these Independence Day activities features elements of Americana that can help your kids connect to their patriotic cultural heritage. 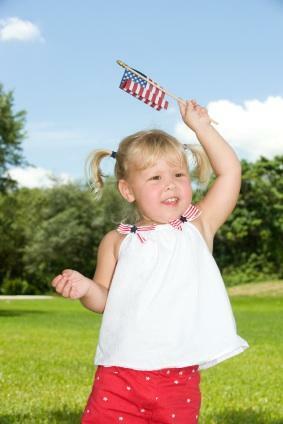 Here are a few Independence Day projects to try with your children. These star twirlers are both an art project and a safe alternative to sparklers all rolled into one. Once the project is completed, your children can have their own daytime "fireworks" show by spinning their colorful twirlers. Using a craft knife, cut an "X" in the center of the lid. Push one end of a thick rubber band through the X, stretching it around the paper clip to keep it from slipping through the X. Leave the other end of the rubber band dangling through the other side. Put sparkly star stickers in a circle around the lid on the same side as the paper clip. Using a craft knife, cut the flexible straw into two pieces - one straight 4" length and another 4" length with the bend in the middle. Using a bent paper clip as a hook, thread the dangling end of the rubber band through the straight portion of the drinking straw. Thread the bent drinking straw through the end of the rubber band loop to use as a handle. To use, wind up the cap and then let it go, causing the cap to twirl as you hold onto the handle. The eagle is a symbol of America. These cookies make this piece of Americana into a tasty snack you can serve at your Independence Day gathering. Melt the white chocolate and place it in a small shallow dish. Allow it to cool slightly, but not solidify. Spread the shredded coconut in an even layer on waxed paper. Coat each of the marshmallows in white chocolate and then roll them in the coconut flakes on three sides. Leave the bottom of the marshmallow covered in white chocolate but not covered in coconut. Place the marshmallow with the white chocolate side down onto the sandwich cookie. Allow the white chocolate to "glue" the marshmallow to the cookie, giving it time for the chocolate to set. Take a toothpick and make a hole in one side of the marshmallow. Insert the end of a cashew into the hole to make the eagle's beak. Use the black decorator's gel to put two spots above the beak for eyes. Place the eagle cookies on a star spangled platter to serve. Have you ever noticed that tie-dye resembles fireworks? Tie dying is a fun summer activity that your kids can do to make their own fireworks t-shirts. There's also another great way to make fireworks t-shirts; glitter fabric paint in bright colors can turn a plain t-shirt into a Fourth of July wearable work of art. Place a few sheets of newspaper inside of the shirt and lie the shirt flat on a solid surface. Pour the glitter fabric paint onto paper plates. Turn your pipe cleaners into a few different fireworks "stamps" by crimping the ends together in a spoke pattern. You can trim the pipe cleaners to different lengths so that you have different sized stamps. Dip the stamps into the different colors of paint and print on the shirts in fireworks patterns. If you are going to be overlapping colors, allow each stamp to dry before adding a new one. Allow the shirts to dry and launder according to the paint manufacturer's instructions. These are just a few of the many projects you can do with your children to help them celebrate the Fourth of July. If you'd like to find even more projects, ideas are only as far as your imagination. Just think Americana, and before you know it, your children will join you on an Independence Day creative adventure.